I was hunting early Thursday morning when this nice 8 pt came out. He dropped where I shot him so, since there was no question about whether he was alive or dead, I left my blind and headed down towards him to get started on my field dressing duties. I got within about 30 feet of him when I heard all of this commotion from my right. I figured it was pigs (I’ve heard that sound before) so I backed into a cedar tree to see if they were heading my way. They were…so this little red piggie is in the freezer now as well. The meat is heading to Hudson’s and the horns are heading to Martinez Brothers. 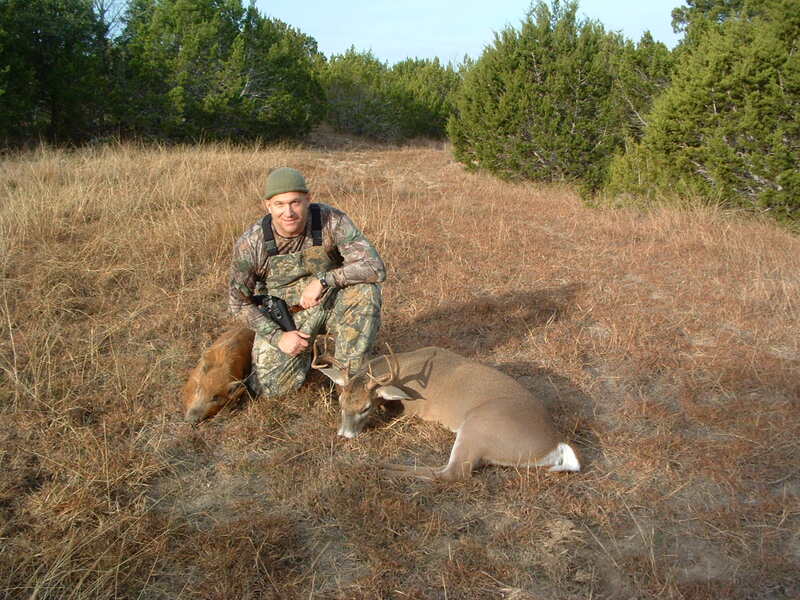 This entry was posted on November 29, 2008 at 1:44 pm and is filed under hunt. You can follow any responses to this entry through the RSS 2.0 feed. You can leave a response, or trackback from your own site. whoa…..NOW I’m excited! When can I take you up on a venison raincheck? Wow! Nice rack… and you look quite elegant in your stocking hat! I’m slow but consistent. Merry Christmas!